Increasing public awareness of the need to ensure the safety and welfare of children led to the passage of the first Federal child protection legislation, the Child Abuse Prevention and Treatment Act (CAPTA), in 1974. While CAPTA has been amended many times over the years, most recently by the Keeping Children and Families Safe Act of 2003, the purpose of the original legislation remains intact. Today, the Children’s Bureau, Administration for Children and Families, U.S. Department of Health and Human Services, is the Federal agency charged with supporting States, Tribes, and communities in providing programs and services to protect children and strengthen families. In the early 1980s, Congress made a further commitment to identifying and implementing solutions to child abuse. Recognizing the alarming rate at which children continued to be abused and neglected and the need for innovative programs to prevent child abuse and assist parents and families affected by maltreatment, the U.S. Senate and House of Representatives resolved that the week of June 6-12, 1982, should be designated as the first National Child Abuse Prevention Week. They asked the President to issue a proclamation calling upon Government agencies and the public to observe the week with appropriate programs, ceremonies, and activities. The following year, April was proclaimed the first National Child Abuse Prevention Month. Since then, child abuse and neglect awareness activities have been promoted across the country during April of each year. The Office on Child Abuse and Neglect (OCAN) within the Children’s Bureau coordinates Child Abuse Prevention Month, providing information and releasing updated national statistics about child abuse and neglect each April. In Title II of the CAPTA amendments of 1996, the Children’s Bureau was charged with identifying a lead agency in each State for Community-Based Child Abuse Prevention (CBCAP) grants. These grants support the development, operation, and expansion of initiatives to prevent child abuse and neglect, as well as the coordination of resources and activities to strengthen and support families to reduce the likelihood of child maltreatment. CBCAP grantees within each State often take a leadership role in coordinating special events and preparing materials to support Child Abuse Prevention Month. Regardless of their role, CBCAP grantees are required to report annually on their Child Abuse Prevention Month activities. In 2003, as part of the 20th anniversary of the original Presidential Proclamation designating April as Child Abuse Prevention Month, OCAN recast the National Child Abuse Prevention Initiative as a year-long effort. This initiative was launched at the 14th National Conference on Child Abuse and Neglect, which was devoted to the theme of prevention. A national press conference there was the setting for the release of the publication Emerging Practices in the Prevention of Child Abuse and Neglect. The expansion of the Child Abuse Prevention Initiative was consistent with priorities of the Administration for Children and Families and the U.S. Department of Health and Human Services. OCAN and Child Welfare Information Gateway (formerly, the National Clearinghouse on Child Abuse and Neglect Information) partnered with the broader child abuse prevention community to raise awareness of the issue through a variety of tools, resources, activities, and public awareness events. Many of these materials have been made available in print and on the web to related Federal agencies, organizations, and concerned citizens in communities nationwide. In 2004, there was emerging consensus among national child abuse prevention organizations and related Federal agencies that building public will for child abuse prevention required engaging the public in efforts to strengthen and support families and enhance parenting skills. Building on this national momentum, OCAN shifted the focus of its child abuse prevention resources to incorporate a family strengthening message promoting parenting and community support. Today, the Child Abuse Prevention Initiative is an opportunity for communities across the country to keep children safe, provide the support families need to stay together, and raise children and youth to be happy, secure, and stable adults. 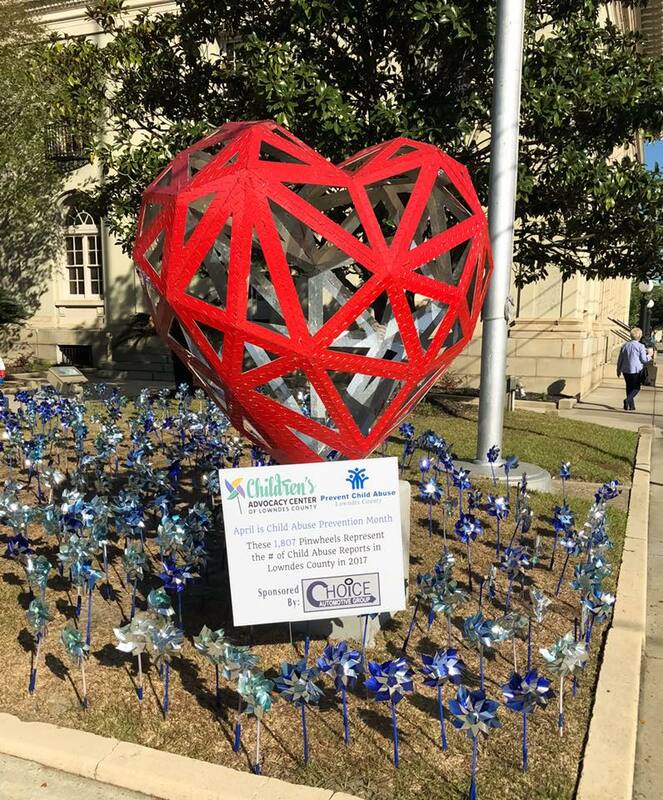 As such, The Children’s Advocacy Center of Lowndes County and Prevent Child Abuse Lowndes County, places pinwheels at City Hall every April to signify the children in our county who have been victims of child abuse. In 2017, there were 1,807 reported cases of child abuse reported to DFCS. This year, we started an initiative to place pinwheels around town, at homes and businesses to spread prevention efforts. Thank you to everyone who participated. We look forward to making this even better and bigger next year.